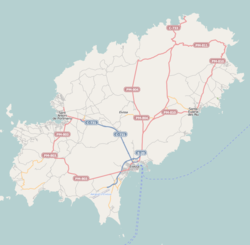 Sant Rafel de sa Creu (Spanish: San Rafael) is a village on the Spanish island of Ibiza. It is located off the main road which connects Ibiza Town and San Antonio and a short walk from two of the most famous Ibiza nightclubs, Amnesia and Privilege. San Rafael is a small, quiet village with little more than a church, a few bars and restaurants. The majority of the village’s population live in the surrounding countryside. This article about a location in the Balearic Islands is a stub. You can help Wikipedia by expanding it. This page was last edited on 26 March 2017, at 21:15 (UTC).